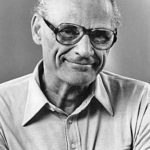 Arthur Miller was an American playwright, essayist, and figure in twentieth-century American theater. Among his most popular plays are All My Sons (1947), Death of a Salesman (1949), The Crucible (1953) and A View from the Bridge (1955, revised 1956). He also wrote several screenplays and was most noted for his work on The Misfits (1961). The drama Death of a Salesman has been numbered on the short list of finest American plays in the 20th century alongside Long Day’s Journey into Night and A Streetcar Named Desire. "I think it’s a mistake to ever look for hope outside of one’s self." "It is my art. I am better at it than I ever was. And I will do it as long as I can. When you reach a certain age you can slough off what is unnecessary and concentrate on what is. And why not?" "The structure of a play is always the story of how the birds came home to roost." "The apple cannot be stuck back on the Tree of Knowledge; once we begin to see, we are doomed and challenged to seek the strength to see more, not less." "Without alienation, there can be no politics." "The problem was to sustain at any cost the feeling you had in the theater that you were watching a real person, yes, but an intense condensation of his experience, not simply a realistic series of episodes."